Surf News, 10 January, 2015 – Known for his progressive longboard and fun board shapes, surfboard shaper Guy Takayama has added two new performance models to his line-up of hyper performance surfboards, to be released this month at Surf Expo. The Pahoa Performance Round Pin and Kanaloa Performance Single Fin combine classic longboarding shapes with speed, advanced materials, and new technologies to push the performance of any level surfer beyond. The new models compliment Guy’s new lineup of hyper performance fun boards and longboards that have taken off since their release in Spring 2014, in both performance and classic longboard communities alike. Guy Takayama Surfboards Team Rider Maui Zack Meyers rode the Ali’i GT7 Performance Noserider in the GoPro ASP World Longboard Championships in Wanning, China last month, while surfers of California Surfing Clubs took podium at nearly every event when riding the performance models. The new Pahoa [Dagger] Performance Round Pin [9’0” 22 ½” x 2 ¾”] is designed for quick maneuverability and holding speed through cutbacks. The round pin tail digs in, and projects up the face of the wave for excellent energy return and rebound off the lip. Guy designed the Pahoa for noseriding while maintaining speed that goes well beyond standard noserider boards. The Kanaloa [God of the Sea] Performance Single Fin [9’4” x 23 3/16” x 2 ¾”] will also be released to the market early 2015. This board glides down the face of the wave and provides smooth turning for long, sweeping carving. The Kanaloa features a square tail, and a wide nose that sets up for noseriding without slowing you down. All Guy Takayama High Performance Surfboard models are available in multiple constructions that feature advanced materials, including XEON Fiberglass, which is a pigmented fiberglass, and carbon fiber. Starting with a hand-tuned, fused cell EPS foam core and proprietary fiberglass stringer system, each model features 12 oz of XEON Fiberglass and/or Carbon Fiber, both top and bottom for increased strength and resistance to heel dents while reducing weight and maintaining flexibility. 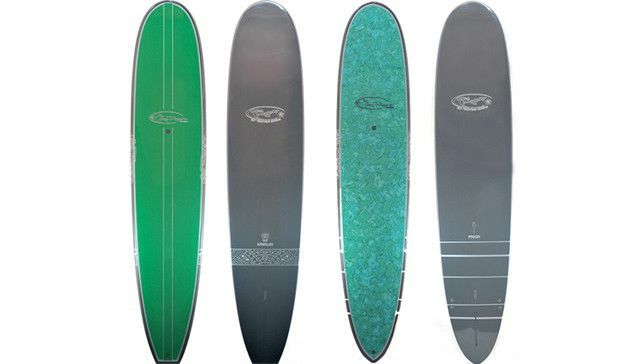 “Polyester materials have been around for a long time and the boards are usually heavy, or if you made them light for performance, their life expectancy was short.” Guy explained about his decision to utilize new materials for this line-up. New Pahoa and Kanaloa models will be showcased at the January Surf Expo and released to market shortly after.